This year sees the tenth anniversary of IWM North and also ten years since the 2003 Iraq War started, so it is quite apt that the museum has a new photographic display by award-winning British photographer Sean Smith. 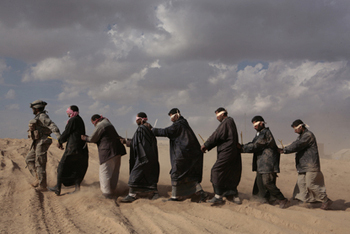 Smith documented the war in Iraq for The Guardian and was in Baghdad when the British and American coalition forces invaded, returning to the country several times to document the lives of the military and civilians. The display covers a period which takes in before, during and after the war and whilst Guardian readers may recognise a number of the images, the display also features some of Smith’s unpublished work as well. The exhibition is divided into two displays: inside there are over 30 images with image descriptions and information panels; outside the museum (car park side) there are 6 large display panels featuring Smith’s images. It is these panels that provide the real impact of the work and I would recommend that you seek out these images first. Unfortunately having crossed over the Lowry footbridge, I entered the museum from the waterside entrance and didn’t see these images until after I had seen the inside display. The reason that I mention this is because on seeing the indoor images, I found myself frustrated that the images didn’t have the display space they deserved. The main exhibition is in The WaterWay, which is the corridor that leads from the stairs to the cafe. Trying to absorb the impact of what is in front of you whilst moving out of the way of people going for their cup of tea is a little distracting. Also I like to be able to stand back from an image to take it in as well as look at it close up, and there is little scope for that, which is fine for the majority of images but a shame for some of the larger prints. It’s very much a case of the right venue but not necessarily the right location within the venue. So to the images - a chronological display of life in Iraq from the sense of building pressure just before the war to the continued tensions after the war. It is very much an exposition of showing the interaction between military and civilian life. It starts with images of Iraqi life just before the onset of war, at a time when Hussein was trying to create a sense that everyday life was going as normal. His images of horse racing and a crowd at a football match serve to demonstrate this. 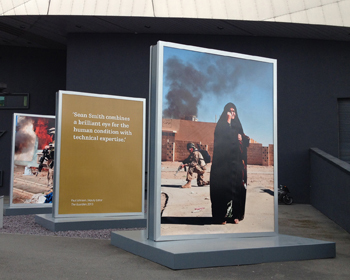 There is a superb range of displaying the two very different sets of lives that have come into Iraq at this time. The images which show civilians and military together, give you a real sense of the term invasion. There is an overwhelming feeling of discomfort and anger at and from both sides. There is a real sense of beauty with Smith’s images, which is incredible given the situation and I found myself at times torn between the beauty of the composition and the actual horror that they are showing. This is particularly the case with '', which shows a marine leading a line of blindfolded detainees in for questioning. The image, quite rightly, won the Photograph of the Year in The Press Photographer’s Year 2006 Awards. Smith has done a wonderful job in displaying the juxtaposition of the two very different lives being lived in Iraq at this time, particularly noticeable in the image of a boy playing in a river whilst being watch by an Iraqi interpreter in combat gear, and also by women shopping in a local market, with a crouching soldier in the foreground of the image. What impressed me about Smith’s work as well as the superb photographs, is the fact that you have a sense of neutrality on his views, he has gone in and recorded a story but looked at it from all sides. I would strongly recommend anyone who is going to see the exhibition to afterwards look at the BBC's Iraq 10 Years: Photographs by Sean Smith which provides the opportunity to see further images with a commentary by Smith explaining the stories behind his images. So is it worth seeing? Whilst as I have already mentioned, the location within the museum may not be ideal and also I would have loved to seen the images framed (they are prints on foamboards), but two things here, firstly the IWM North describes it as a display, not an exhibition, which for me are quite different things and yes the description of display fits it perfectly. Secondly, the overall importance of a collection such as this is to stop and make you aware and make you think about the content, which it certainly did. Smith’s talents are impressive, I’m completely in awe of war photographers who manage to create images like this in the conditions that they are under. The images are at the same time beautiful and disturbing and act as an important reminder of the effect of the impact of war on both civilians and the military. If you are in the area of Salford Quays, it is certainly worth a visit and with free admission to the museum, it is a worthwhile and educational trip.